Live bearing fish are often called as livebearers. These live bearing fish give birth to young ones which are free swimming. Members of the family Poeciliidae are the favoured ornamental live bearing fish for the hobbyists and the most common among them are the guppies, mollies, platys and swordtails. Halfbeaks , splitfins, and freshwater sting rays are rarer ornamental live bearing fish kept by advanced hobbyists. The egg laying ornamental species lays thousands of eggs at one time and the eggs and the hatchlings are subjected to great dangers and predation and only a few grow into adults in the nature. The ornamental livebearers fish produce limited number of off-springs depending upon the size and age of the live bearing fish mother. However their babies have the advantage of bigger size when compared to hatchlings from eggs and have better survival rate. The female livebearers do not lay eggs like most of the oviparous ones. The eggs are retained inside the body of the live bearing fish mother and the fertilisation takes place inside the body. After full growth the babies are released from the body by the live bearing fish. There are two types of livebearers namely ovoviviparous types and viviparous types. In ovoviviparous live bearing fish though the eggs are retained in the body, except for protection, the eggs are independent of their mother. They do not derive any nutrition from the mother. The members of the family Poeciliidae like guppies etc belong to this group. The ornamental females have structures for supplying nutrition to the eggs which are analogous to placenta of mammals. The halfbeak and splitfins come under this group of live bearing fish. The males have intense reproductive instinct of chasing females and mating them. The male to female ratio of live bearing fish may be kept greater than 1:3 so that the females are not stressed. The female tend to be larger in size when compared to males livebearers. The males of livebearers deposit the sperms in 'packs' called spermatophore into females. With one time mating live bearing guppy female can keep producing 4-5 broods without further mating using the earlier deposit. The ornamental live bearing fish are docile in nature and move in groups preferring company. They can also be kept in community aquarium as they are compatible with other species. The sword tails among the ornamental livebearers are very active and they may jump out of the aquarium tank. Care must be taken to properly cover the tank. The dominant males may chase away the weaker ones. These have the tendency to eat their own young ones and if they breed in the tank the young ones must be transferred to another tank to save them from being eaten up. These live bearing fish do well in higher hardness of water. Mollies and guppies prefer slight salinity for healthy growth. Swordtails and platys do well in cold waters and do not require heating. These ornamental live bearing fish are omnivorous and accept formula feed readily. Ornamental Guppy livebearers (Poecilia reticulata): These ornamental livebearers are very hardy ones suitable for beginners.The females tend to be larger than males. These livebearers are omnivores accepting all types of food. For breeding female require worm food. These ornamental live bearing fish stand greater temperature fluctuations but prefer warm waters. 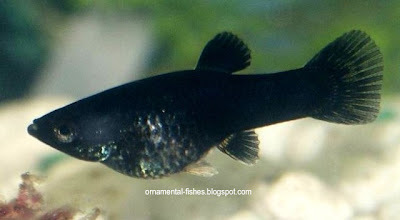 Ornamental Molly (Poecilia sphenops): This ornamental live bearing fish is also hardy one suitable for beginners. Though usually denoted as black molly a number of colour varients like white molly, dalmatian molly, black molly and golden molly are available. These ornamental livebearers also accepts all types of food. Ornamental Sailfin Molly: Both the species Poecilia velifera and Poecilia latipinna are being called sailfin molly.The dorsal fin of these ornamental livebearers are exaggerated resembling a sail. These are a bit delicate and require careful handling.These ornamental livebearers accept any formula feed. 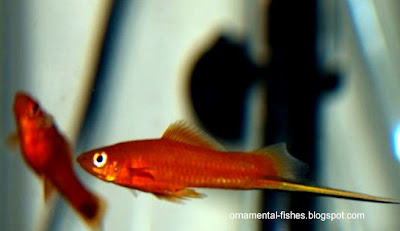 Platy (Xiphophorus maculatus): These ornamental livebearers are very hardy and are docile. A number of colour varients are present. These livebearers eat all types of food.Platys and swordtails belong to same genera of live bearing fish and are inter-bred to get hybrids which are also live bearing ornamental fishes. 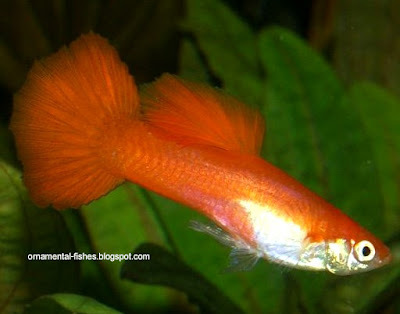 Swordtail (Xiphophorus helleri): Many ornamental colour varieties are available right from black, green, orange to red. These ornamental livebearers are very active species and sometimes jump out of the tank. These live bearing fish prefer colder waters and accept all types of feed. They are larger in size when compared to above types of livebearers.